In a large bowl mix the flour with baking powder & baking soda. Put the oil, orange juice, sugar, cinnamon, clove and cognac in a mixing bowl and beat until thoroughly blended. Roll the dough into cylinders about 5 cm long and 3 cm in diameter flatten them with your hands (or a fork) and place them on a baking sheet. Bake at 180 Celsius for about 20-25 minutes. For the syrup, put in a large pot water, sugar and honey and bring to a boil. Let it boil for about 4 minutes, and then leave it on the fire in order to keep it hot. Lay each cookie in the syrup for a few seconds, take it out (don’t leave it more than a few seconds in the syrup) then place it on a plate and sprinkle some ground walnut on top of it. 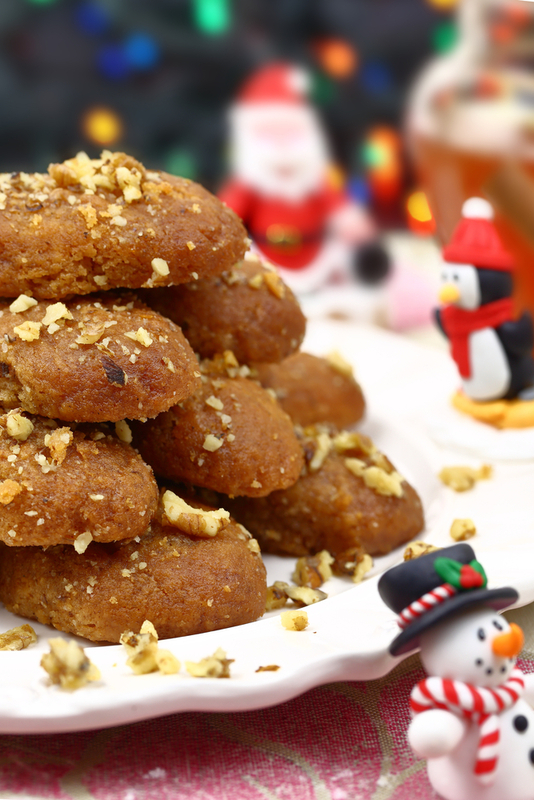 Continue until all cookies have been dropped in syrup and sprinkled with walnut. Keep in mind that melomakárona are great keepers. They can last for at least two weeks!